Casey Hathaway went missing from the backyard of his grandmother's home Tuesday. A search is intensifying through difficult, rugged terrain and cold temperatures for a missing 3-year-old boy in North Carolina, officials said. "Our number one priority is to find Casey," Craven County Sheriff Chip Hughes told reporters Wednesday. 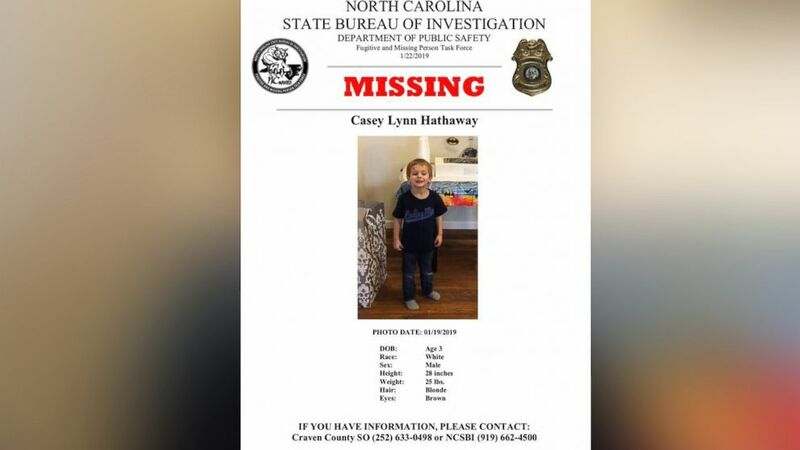 (Craven County Sheriff's Office) Authorities are searching Casey Lynn Hathaway, a missing 3-year-old boy. "No tip is insignificant," the sheriff said Wednesday. "We're not giving up," added the county's emergency management coordinator, Stanley Kite. Casey has blonde hair and brown eyes. He stands at 28 inches tall and weighs 25 pounds, the sheriff's office said.